"A Primer on Kubernetes [White Paper]"
Kubernetes is Google’s third container management system that helps manage distributed, containerized applications at massive scale. Kubernetes automates container configuration, simplifying scaling, and managing resource allocation. It comprises a rich set of complex features, and understanding this new platform is critical to the future of your organization. Kubernetes also manages their lifecycles, and maintains and tracks resource allocation in a cluster of servers. 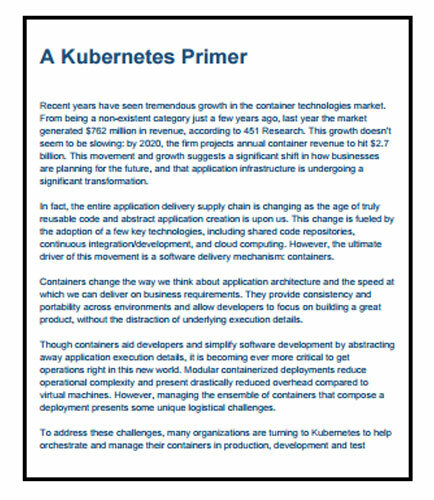 This whitepaper provides insights on how to address these challenges, as many organizations are now turning to Kubernetes to help orchestrate and manage their containers in production, development and test environments. Docker is an apparatus that bundles, arranges and runs application containers independent of the Operating System. Container technology is accessible through the OS: A container bundles the application administration or functions with the majority of the libraries, sets up records, conditions and puts other important parts to work. Every container is allocated under the administration of one hidden OS. Containerization is an operating system-level virtualization strategy for running distributed applications without having the need for launching virtual machine, for each application. It involves the running of a multitude of isolated systems on a single host and accesses a single kernel. Environment variables, files, and libraries necessary to run the desired software are some of the key components of application containers. Kubernetes, the Google-designed software, is an open-source system that automatically deploys, scales, and operates on Linux based operating-system-level-virtualization also known as containers applications.